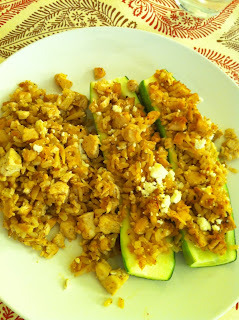 Cut zucchini in half lengthwise and using a small spoon, carefully scoop out flesh leaving a thick shell around edges. Place zucchini cut-side down in glass baking dishes (microwavable) and add 1/2 cup water. Cover with plastic wrap and vent one side and microwave for 4 minutes. Heat oven to 400 and in a large non-stick pan heat oil over medium heat. Sweat onion, peppers, and garlic until translucent. Chop cooked chicken (I grilled mine) into small piece and add to skillet. Pepper, salt and add almonds and rice. Let cook in for about 5 minutes.